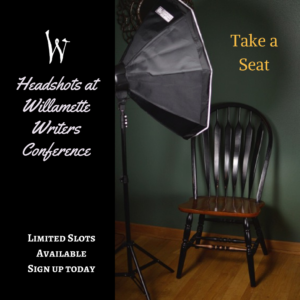 For the first time ever, the 2017 Willamette Writers Conference will have a professional photographer at the conference to take author headshots. A limited number of slots will be offered Friday and Saturday afternoon, so book your slot before they are all taken. Why Do Author’s Need Headshots? Last year’s conference keynote speaker Jane Friedman says a professional author photo, like an author website, is important if you want to make the right impression. A good photo can instill in viewers that you are successful or have the potential of becoming successful. Christina Katz, in her book Get Known Before the Book Deal, says authors with professional photographs communicate without words that they are professional and ready for publicity, which increases their chances of getting selected by publishers and agents. Self-published authors also benefit from having professional photos to use in their book marketing campaigns. Our photographer, Gail Pasternack, specializes in taking headshots of authors and artists. She is a writer herself, so just like she strives to illustrate the inner lives of her characters, she seeks to capture the essence of her writer clients. Authors need headshots that promote their platform and represent their brand, which is why Gail takes into consideration what each author writes, be it literary fiction, genre fiction, creative nonfiction, screenplays, or poetry. If you sign up for a headshot, she will work with you to find your best angles and take flattering photos that project confidence, success, and a compelling backstory. After the conference, Gail will send you digital files of your best photographs, which you can use on your website, in social media, and on the back your books. Slots are limited. Sign up today!